Memory: The ability to store and retrieve (recall) information. Learning: Updating or replacing the stored information found in our long term memories. NB: As much as 70-90% of learning could be lost if we do not actively work with the new information. Note important review times: 10 mins/daily/weekly/monthly. It is not usually enough just to listen or just to read. Memory processes work by linking and associating. Think about how you can link the new material to material you already know. Ask yourself: How is this the same as something I already know? How is it different? What is an example (or an analogy) to illustrate the idea? Does this information change ideas I have previously held? How can I use this information? Does it have meaning for me? What are the consequences of this information? Discuss the information. BE CAREFUL - it is important to work towards an accurate understanding. Lay down your memories carefully. Figure 2. 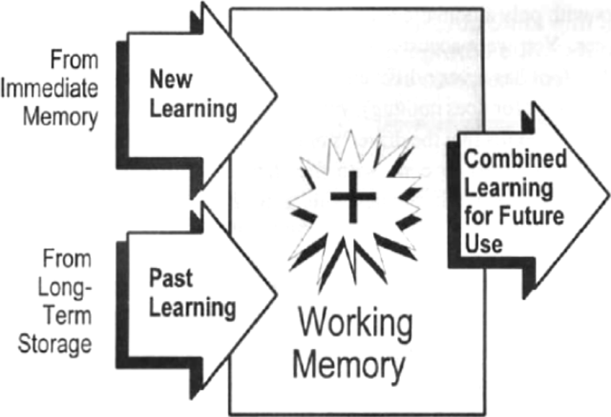 New learning and past learning coming together in working memory is one part of transfer. The learner’s understanding of how the combined learning can be used in the future is the other part of transfer (Sousa, 2001, p.137). Ask: What are the most important things I need to remember? What are the key words? What are the key ideas? It is possible to increase the items working memory can handle at one time through chunking/grouping items, so memory sees the group as one item, not separate fragments. Which is the easiest to remember (1) or (2)? Try and organise your notes into 5 - 9 bits of organised information. Create a mental picture of a scene containing the items to be remembered. Draw the picture to help you remember it. Remember where items are on a page; this can help recall patterns flowcharts etc. Stop and draw a diagram, chart or picture; underline or highlight. Use colour to make notes stand out. Read important sections or ideas aloud. Practise saying items you want to recall aloud if possible. Use rhythm or song. Put words or ideas into a tune. This can be literal or in your imagination. Some people use tapping of fingers etc to aid recall. Make up a word using the first letter of the words to remember. ANZAC : Australia & New Zealand Army Corps. Very similar to an acronym except the order of letters is changed to make a more memorable word. Acrostics can be used to help remember the spelling of a word. eg Arithmetic : A rat in the house might eat the iced cake. Make up a story using the items on the list. It is easier to recall a story than a series of unrelated words, especially if you need to remember the words in a specific order. When I woke up I felt DOPEY. I’m not usually SLEEPY in the morning, but this morning I felt GRUMPY because I had to visit the DOC . . .. . . Figure 4. 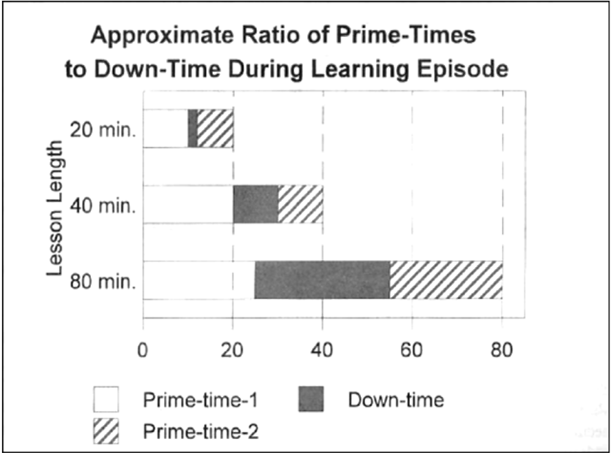 By dividing each learning episode into 20-minute segments, there is proportionately more prime-time to down-time (Sousa, 2001, p. 91-93). 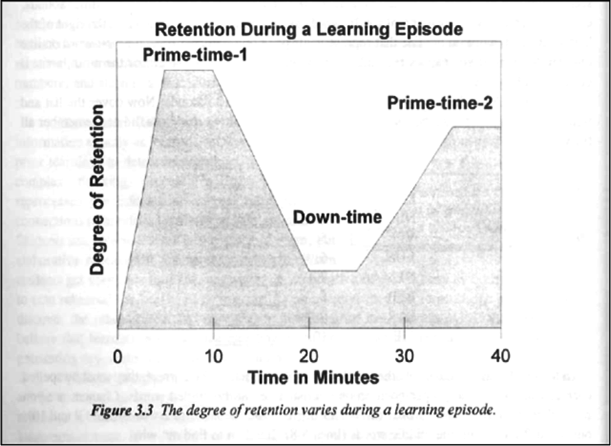 There is a higher probability of remembering if you keep the learning episodes short and meaningful. Review the previous session in each new session. Repeat, review and rehearse material. 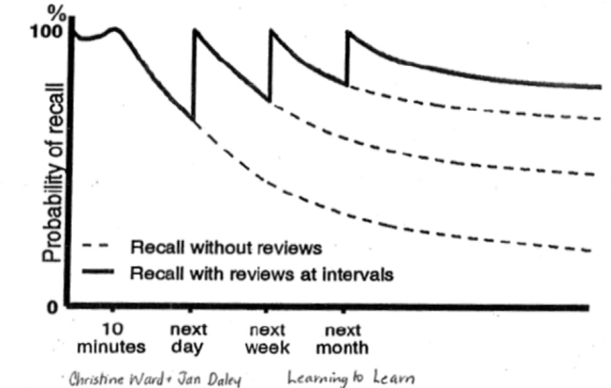 Use active repetition – recite/recall/write out. Most of us remember things if they make sense/ Are familiar/Are grouped or linked in some way /Are experienced or repeated regularly. 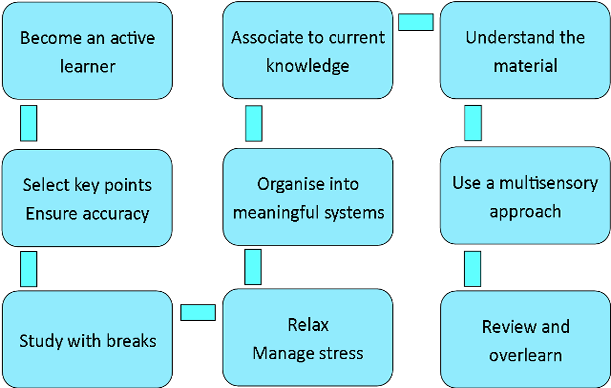 Overlearning material will increase your retrieval speed and improve your confidence. Cotterell, S, (1990). The study skills handbook. London, England: Macmillan Press. Dryden, G., & Vos, J. (1993). The learning revolution: A lifelong learning programme for the world's finest computer: Your amazing brain. Auckland, New Zealand: Profile Books. Gray, M. (1992). Improve your memory skills: A practical course to remembering & forgetting. Melbourne, Australia: The Business Library. James, J., & Brooks, J. (1996). Study skills guide. Porirua. New Zealand: Whitireia Publishing Massey University, Learning skills consultancy. Rose, C., & Goll, L. (1992). Accelerate your learning: Introduction. Aylesbury, England: Accelerated Learning Systems. Sousa, D. A. (2001). How the brain learns (2nd ed.). London, England: Corwin Press Sage Publications. Ward, C., & Daly, L. (1993). Learning to learn: Strategies for accelerating learning and boosting performance. Christchurch, New Zealand: Author.